Bounce house delivery to Cape Coral, Fl. We also deliver our bounce house rentals to North Fort Myers, FL, Fort Myers, FL, and Fort Myers Beach, FL. With our low prices many of our customers choose to go with a larger bounce house with climbing area, slide, and basketball hoop. We call these gigantic bounce houses Combo Bounce Houses. 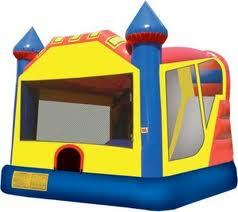 Some of our combo bounce houses can transform a dry slide into a water slide for extra fun for the kids.